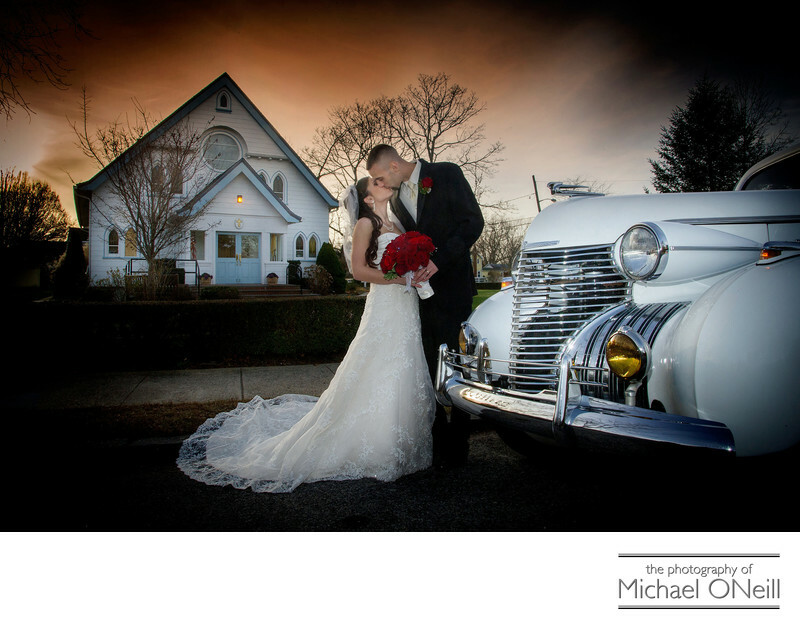 This beautiful sunset image of the bride, groom and their vintage Cadillac automobile limousine was taken outside the church in Bellport, NY where their wedding ceremony was held. As the sun was setting quickly we took all the formal and fun, spontaneous photographs of the couple and their bridal party right here on the grounds of the church. Afterwards the wedding party, including the precious flower girls and handsome ring bearer made the trip to one of Long Island’s most elegant catering establishments: The Carltun at Eisenhower Park in East Meadow, New York. This Nassau County wedding reception venue rivals anything that New York City NYC has to offer. Great food, impeccable service and some of the most extraordinary interior spaces and outdoor gardens you will ever see. I have had the pleasure of photographing many weddings at The Carltun over the years and have the experience it takes to create amazing wedding photographs here. The gardens, with their impressive fountains, are the perfect spot for wedding photography and casual outdoor marriage ceremonies. The main ballroom is one of the finest appointed rooms of it’s type anywhere in New York. If you are planning a wedding at The Carltun you owe it to yourself to discuss your wishes and plans for the big day with me. I look forward to hearing from you.